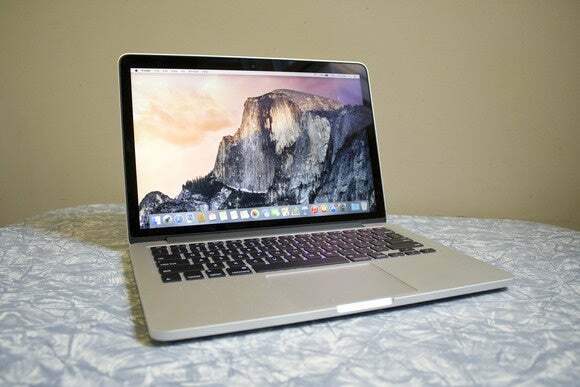 The upgrades to the laptop include the new Force Trackpad and faster processors. From the outside, the new 13-inch MacBook Pro with Retina display looks like the MacBook Pro we’ve come to know from the recent past. The major changes to the laptop are only apparent once you start using the machine: increased speed, and a new Force Touch trackpad that provides new input functionality. The changes are most certainly welcomed, but overall, they may not be enough for anyone who bought a 13-inch Retina MacBook Pro within the past three years to upgrade. But if your laptop is older, or you’re thinking about upgrading from a MacBook Air, you’ll see great benefits. When you press it, the 13-inch Retina MacBook Pro’s Force Touch trackpad feels like it clicks, but the click you actually feel is haptic—technology is used to create a sensation of clicking. For longtime MacBook users, you can notice a difference when the new 13-inch Retina MacBook Pro is off: You can still click a trackpad on an older MacBook that’s powered off, but tap on the Force Touch trackpad and it feels dead, like you’re pressing against the laptop case itself. In System Preferences > trackpad, you can adjust the amount of pressure needed to perform a click. The Force Touch trackpad has sensors to detect how hard you’re pressing. You can press to click like you normally would, but you can also perform a Force Click by pressing a little harder; you’ll feel a second, more pronounced click. Force Click has different functions; it can be used for Quick Look in the Finder; Force Click on a date and a pop-up appear to add an event to Calendar; it can activate Look Up; it shows a preview when you Force Click a web link; and much more. I’ve always used the trackpad as a last resort. I prefer a mouse because my fingers fumble when I have to do things like click and drag to select part of an image or a section of text. 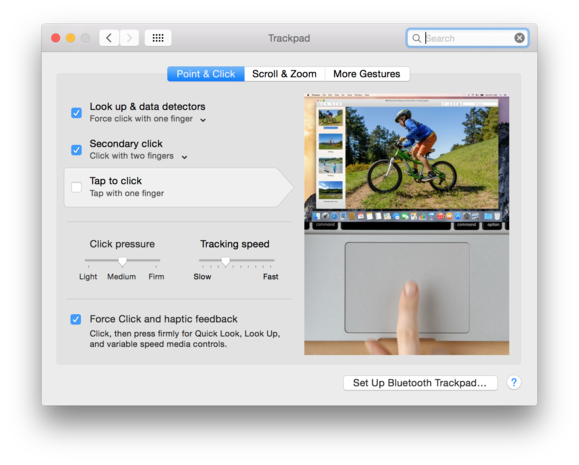 But Force Click has me using the trackpad more often because it’s so useful. I don’t see myself ditching the mouse soon, but I could be using it less and less. The other updates are inside the laptop. 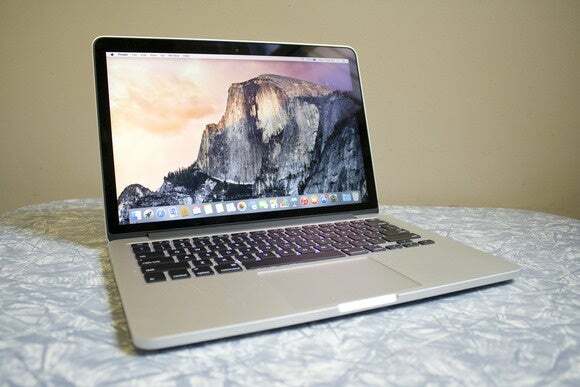 Apple replaced the Intel Haswell processors in the 13-inch Retina MacBook Pro with new Broadwell processors. The base laptop ($1299 at the Apple Store) has a dual-core 2.7GHz Core i5 processor, with Turbo Boost support up to 3.1GHz, 3MB of shared L3 cache, and 128GB of flash storage. The middle-tier model ($1499 at the Apple Store) has the same processor as the $1299 version, but it has 256GB of flash storage. 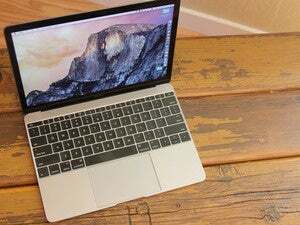 The fully loaded model ($1799 at the Apple Store) has a 2.9GHz Core i5 processor with Turbo Boost support up to 3.3GHz, and 512GB of flash storage. Along with the processor upgrade comes a graphics upgrade. The new Intel Iris Graphics 6100 is still an integrated graphics processor, but Apple says it’s 40 percent faster than the Iris Graphics 5100 integrated graphics in the previous Retina MacBook Pro. Apple also says the flash storage is also up to two times faster than before. 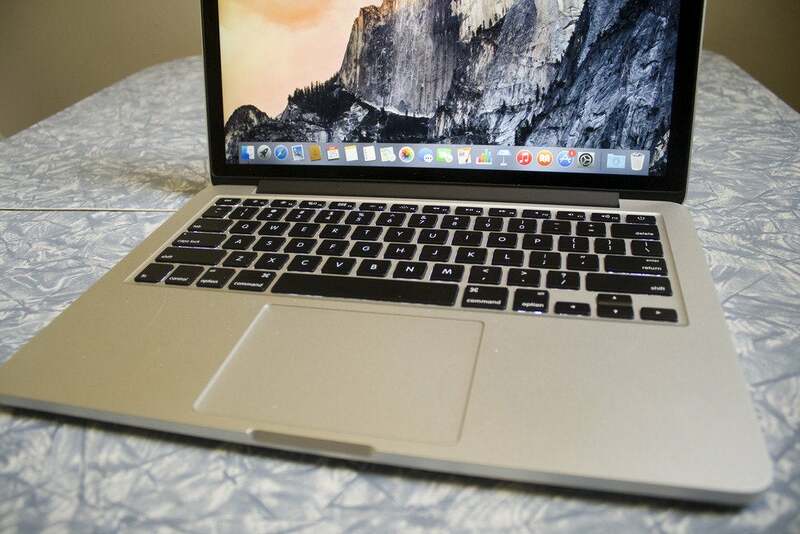 The new 13-inch MacBook Pro has the Force Touch trackpad. The keyboard hasn't changed, however. As expected the performance difference between the new 2.7GHz and the 2.9GHz Retina MacBook Pro is marginal, with the 2.9GHz laptop about 5 percent faster than the 2.7GHz laptop in Geekbench 3 tests. But remember, the price difference between these models doesn’t just cover the processor upgrade; it also include more flash storage capacity. Even when compared to last year’s 13-inch Retina MacBook Pro, the new models are only 7 percent faster than the older laptops they respectively replace. In order to see gains over 10 percent, you have to compare the new laptop to models released in 2013. The graphics improvement is much more impressive: The new 13-inch Retina MacBook Pro had a 29 percent increase over last year’s models in the Cinebench OpenGL tests. It’s not the 40 percent that Apple touts, but Apple’s testing was done with a different benchmark that includes three video games. In the Black Magic Disk Speed Test, the 13-inch Retina MacBook Pro posted an average write speed of 1156.1 MBps and an average read speed of 1299.9 MBps. The performance charts for Geekbench and Cinebench are posted here. The charts include data points from the MacBook, MacBook Air, and recent Retina MacBook Pros for your reference. However, if you bought a 13-inch Retina MacBook Pro in the past couple of years, you might want to stick with your laptop a bit longer, since you may not consider the speed gains worth the expense. The Force Touch trackpad is a great new feature, but it’s not vital to your workflow and not enough reason alone to upgrade.